A reliable source for Office Platforms information and a resource for accessing leading Office Platforms and suppliers. 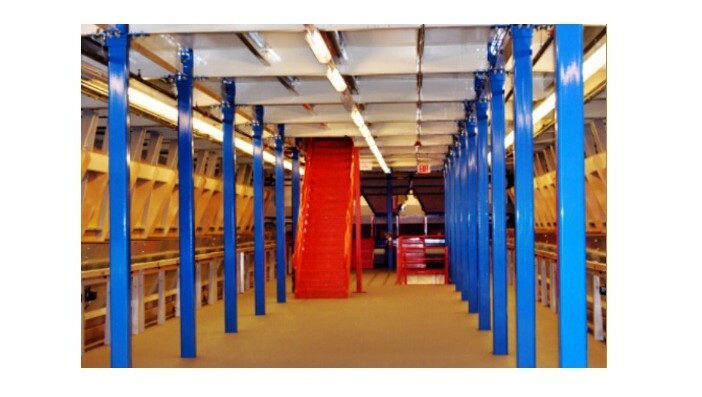 Office platforms are modular office spaces created using mezzanine platforms. Mezzanine platforms are raised floors supported by structural components, such as columns, beams and fasteners. The goal of office platforms is to both create office space and generally increase workspace. Users may use the office platform as a ceiling or as a floor. The space above or below the floor usually functions as storage space or extra workspace. When designing your office platform, mezzanine manufacturers consider factors like: weight capacity per square foot, workspace surface area (dimension), building ceiling height, application/industry standard requirements and building codes. While they offer a variety of standard layouts and prefabricated parts, they also take your application into consideration and make only the best choices for you. Usually, manufacturers construct office platforms from strong materials like galvanized steel, though the treatment of the metal base depends on your application. For example, if people will be walking on the raised office platform, you may want treading from diamond steel or grating. For a more professional look, you may prefer a plywood covering. If the raised space is for storage, you may prefer panels or grating that complements the space, size and weight of your storage items. Office Platforms Office platforms are modular office spaces created using mezzanine platforms. Mezzanine platforms are raised floors supported by structural components, such as columns, beams and fasteners. For your convenience, office platform manufacturers may install utilities in your office platform floor, such as water pipes and electrical wires. If your office is located in lower space, it’s also usually easy for manufacturers to add prefabricated walls for privacy. To get to the upper section of the platform, they will usually design stairs or risers of some sort. They offer a few different stair types, namely closed riser and open riser stair types. Like the platform itself, the stairs may have any number of tread varieties. They typically also have handrails. Office platforms are an excellent investment for a number of reasons. First, office platforms allow you extra usable space without forcing you to go through the trouble of expanding your existing or constructing new facilities. Such an expansion would cost you significantly more time, money and resources than simply installing an office platform, which is not even connected to the permanent foundations of your building. In addition, because office platforms are so often prefabricated in factory, they are easy to install and disassemble and reinstall somewhere else, if necessary. As an aside, an elevated office gives a floor supervisor an excellent view of the going-ons of the facility.